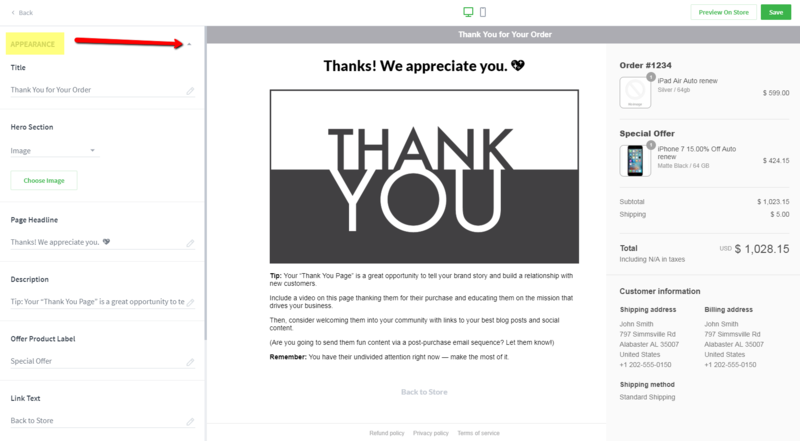 Your “Thank You Page” is a great opportunity to tell your brand story and build a relationship with new customers. Include a video on this page thanking them for their purchase and educating them on the mission that drives your business. Then, consider welcoming them into your community with links to your best blog posts and social content (Are you going to send them fun content via a post-purchase email sequence? Let them know!). Remember: You have their undivided attention right now — make the most of it! The "Title" of the page shown at the very top of the page. Default text is "Thank You for Your Order. Disabled - Uses no image or video for this section of the Thank You page. Image - Upload a custom image from your computer by clicking the "Choose Image" button. Shown above the "Hero Section" on the page. Default text is "Thanks! We appreciate you. 💖"
Font Styles, Fonts, Font Size, Font Colors, Bold, Italicize, Underline, Remove Font Styles, Unordered List, Ordered List, Paragraph Spacing, Image, Link, Video, Line Height and Code View. *Useful tip: Using the "Code View" option you can add custom HTML code to the offer page. This is the "Special Offer" text that will be shown above any upsell/downsell items in the Order Summary section that have been added to the order. Set the "Headline Background Color" for the Thank You page. The Thank You Page preview window allows you to see your edits applied updated in real-time! You can switch between Desktop and Mobile views by clicking the desired device icon. The "Show Order Summary" dropdown also works when clicked in the Mobile preview window. *Note: The "preview window" and "preview URL" are just previews. The order summary section on the "live" OCU Thank You page will appear differently for each of your customer depending on which items they've purchased. Once you have everything configured to your liking, click the "Save" button to save your changes!